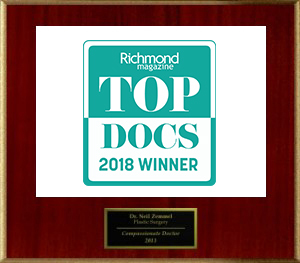 Richmond, Virginia Plastic and Reconstructive Surgeon Neil J. Zemmel, MD, FACS has dedicated his career to becoming the best plastic surgeon possible. 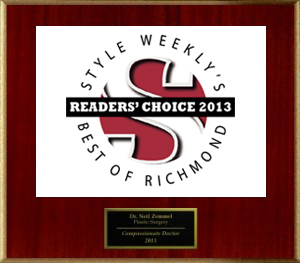 He offers the full breadth of cosmetic, plastic, and reconstructive surgeries at Richmond Aesthetic Surgery. 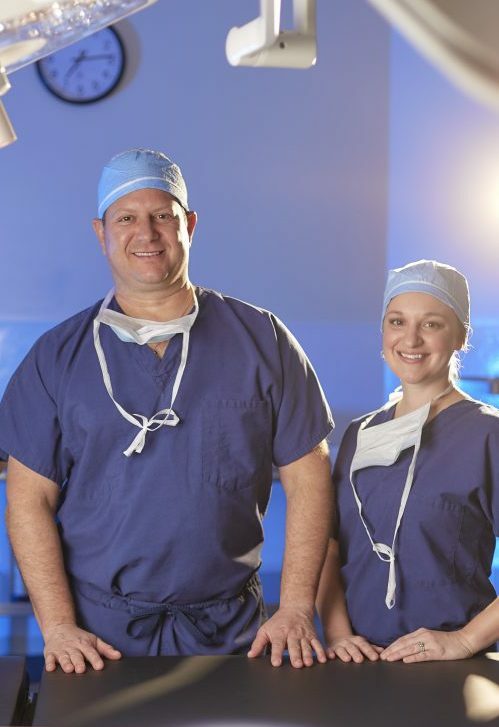 Dr. Zemmel is known throughout Richmond and the Mid-Atlantic area for having particular expertise in breast augmentation and advanced breast reconstruction and breast revision procedures. He also performs cosmetic surgery of the breast, face, and body, as well as reconstructive procedures of the breast, face, trunk, and extremities. In addition to the surgical side of his practice, Dr. Zemmel and his team offer medical grade spa services and numerous non-invasive laser treatments. Dr. Zemmel was born in Norfolk, Virginia, and attended the Norfolk Academy preparatory school founded in 1728. During his early years, Dr. Zemmel was exposed to the internationally renowned plastic surgery program at Eastern Virginia Medical School in Norfolk, Virginia. This early exposure had a tremendous influence on Dr. Zemmel, and he decided to pursue a career in Plastic Surgery in junior high school. Upon graduation from the Norfolk Academy, Dr. Zemmel attended the prestigious College of William and Mary in Williamsburg, Virginia. There he studied both science as well as fine arts. Dr. Zemmel discovered a passion for art and architectural history. Dr. Zemmel obtained a Bachelors of Science with Honors in Chemistry and minored in art history. He also concentrated in Physics, Mathematics, French, and Literature. He received numerous awards and scholarships for his work at William and Mary. 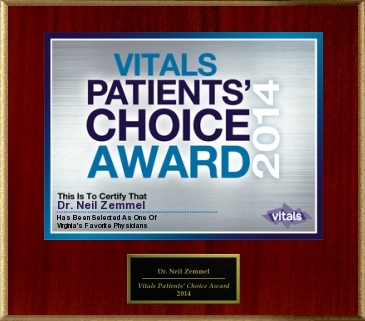 In 1994, Dr. Zemmel began studying medicine at the University of Virginia School of Medicine. Here Dr. Zemmel studied the basic sciences including physiology, anatomy, biochemistry, pharmacology, and pathology. He also rotated through all of the core medical specialties including internal medicine, pediatrics, obstetrics, and family medicine, before pursuing his studies in surgery. Dr. Zemmel obtained the outstanding score of 98% on the United States Medical Licensing Exam Part I. Dr. Zemmel participated in medical research while at the University of Virginia and published four research papers in peer-reviewed medical journals. In 1998, Dr. Neil J. Zemmel “matched” into the highly competitive combined 6 years Plastic and Reconstructive Surgery program founded by Dr. I. Kelman Cohen at Virginia Commonwealth University Medical Center in Richmond, Virginia. Dr. Zemmel completed a 1-year surgical internship followed by 2 additional years of General Surgery training. 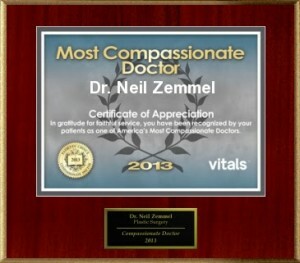 Dr. Zemmel received training in cardio-thoracic, vascular, transplant, trauma, and general surgery. He spent one full year learning the latest critical-care techniques in the intensive care unit. He scored 90th percentile on the General Surgery in-service exam. In 2001, Dr. Zemmel then began training in Plastic and Reconstructive Surgery. During this 3 year program, Dr. Zemmel’s training extended the full breadth of cosmetic and reconstructive techniques including head and neck reconstruction, hand and upper extremity surgery, microvascular surgery, breast reconstruction, burn reconstruction, and cosmetic surgery. 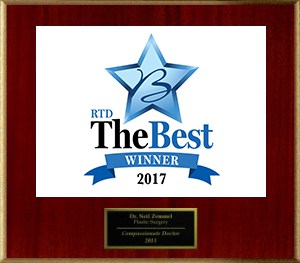 Dr. Zemmel served as Chief Resident of Plastic Surgery during his last year of training and scored 92th percentile on the Plastic Surgery In-Service Exam. For this accomplishment he received the prestigious S. Dawson Theogaraj Scholarship Award. He then joined the academic faculty at the Virginia Commonwealth University Medical Center where he participated in resident teaching and academic research. Dr. Zemmel performed many difficult and complex reconstructions of the head, neck, upper and lower extremities. He has treated severe traumatic and burn injuries of face and hands. Drs. Neil J. Zemmel and Austin I. Mehrhof performing bilateral cleft lip repair in Guatemala City, Guatemala, Operation Kids. Dr. Zemmel has participated in medical missions to Guatemala with the Operation Kids surgical mission group founded by Dr. Austin I. Mehrhof. Operation Kids travels to Guatemala annually and performs cleft lip, cleft palate, and burn reconstructions to those in need. Zemmel has also published numerous scientific research papers on a wide range of subjects including the use of computers in medicine, microsurgery, burn surgery, and cosmetic surgery. Dr. Zemmel’s research interest is in breast reconstruction and cosmetic surgery of the breast and body. 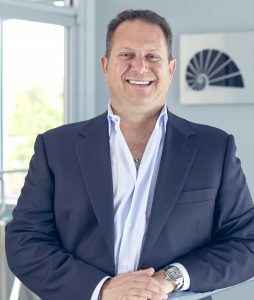 He has lectured on a wide range of topics including the latest techniques in liposuction, artificial skin technology, breast reconstruction, and new facial rejuvenation techniques. Upon completion of his training, Dr. Zemmel entered private practice in Miami Beach, Florida in 2004 where he practiced Cosmetic and Plastic Surgery on South Beach and in greater Miami. He has made numerous media appearances and has been featured several times on local news programs in Miami and West Palm Beach, Florida. After 3 years in Florida, Dr. Zemmel returned to his native Virginia and founded Richmond Aesthetic Surgery in Richmond, Virginia. 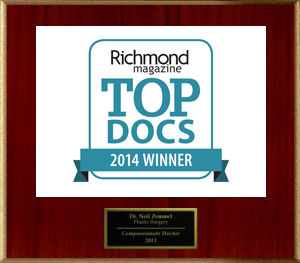 In 2014, Dr. Zemmel was selected as a “Top Doc” by Richmond Magazine. This annual issue features the top doctors of the region, as nominated by local physicians. 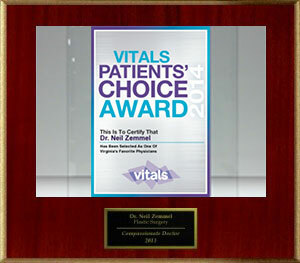 Dr. Zemmel was honored with this title, being recognized for the superior surgical care he and his team offer. 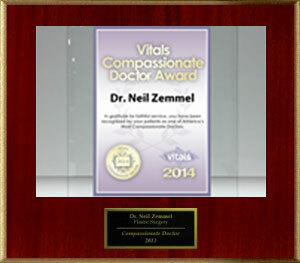 Dr. Zemmel was also selected as a “Compassionate Doctor” by Vitals. Out of 870,000 active physicians, only 3% are awarded this distinction by patients. During 2016, Dr. Zemmel was one of only five doctors selected by Allergan to participate in a special preceptorship for advanced cosmetic breast surgery with Dr. Charles Randquist in Stockholm, Sweden. Dr. Randquist is renowned for his cosmetic breast surgery techniques, and by training under him, Dr. Zemmel was able to further hone his skills in providing highly aesthetic outcomes for his breast surgery patients. 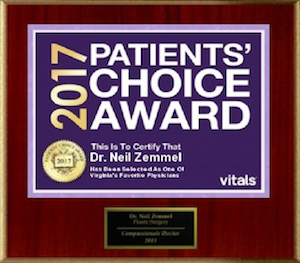 With a commitment to high quality care and results, Dr. Zemmel has been featured in the media on several occasions to share his surgical expertise. This has included television features on the daytime talk show The Doctors, where he presented a complex body contouring procedure for a young man’s major weight loss. In another pro bono case, Dr. Zemmel has worked with a domestic violence survivor to repair a ruptured implant, which was aired on NBC 12 News. To further educate the public on plastic surgery, Dr. Zemmel has also provided insight on the latest procedural advancements in news stories over the years, including segments on VASER® Lipo for NBC 6 and SmartLipo® for NBC 29. Dr. Zemmel holds medical licenses in Virginia. He performs surgery in his office suite, at St. Francis Hospital located in Midlothian, Virginia and at St. Mary’s Hospital in Richmond’s West End. Dr. Zemmel is currently Medical Director of Plastic Surgery Services at St. Francis Hospital. 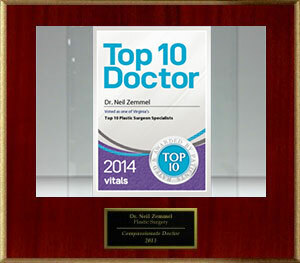 Dr. Zemmel is a Diplomate of the American Board of Plastic Surgery. 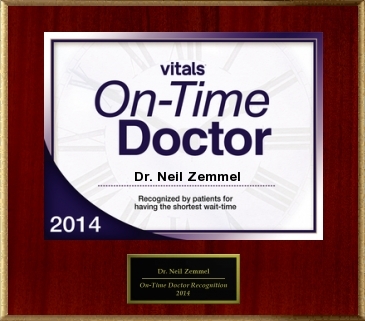 Dr. Zemmel obtained this prestigious Board Certification in 2006. He is an active member of the American Society of Plastic Surgeons, the American Society for Aesthetic Plastic Surgery, and is a Fellow of the American College of Surgeons. Dr. Zemmel is also a member of the Medical Society of Virginia. Although it may be surprising, plastic surgery procedures may be legally performed by doctors who are not plastic surgeons. Plastic surgeons spend years of additional education focusing on reconstructive and cosmetic surgery. During this time of specialized training, plastic surgeons study the intricate relationship among muscle, fatty tissue, skin, ligaments, and bone in order to safely and effectively perform complex procedures. Whether you seek to rebuild an area of the body after an injury, correct a birth abnormality, or cosmetically enhance your appearance, a plastic surgeon has the necessary knowledge to achieve natural looking, beautiful results. 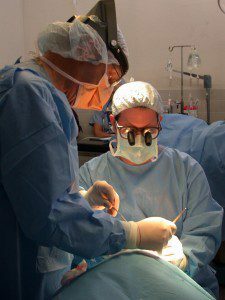 What Does It Mean to Be a Board-Certified Plastic Surgeon? Not all plastic surgeons are certified, and not all board certifications are equal. Plastic surgeons certified by the American Board of Plastic Surgery (ABPS) are required to have undergone at least six years of specialty training, pass rigorous examinations, and maintain high standards of plastic surgery excellence. This distinction allows patients to feel comfortable and safe when choosing a plastic surgeon. As a result of their additional training, board-certified plastic surgeons often have more experience than plastic surgeons who are not certified, which can ultimately lead to greater patient satisfaction. When researching the board certification of a potential plastic surgeon, look for doctors who are certified by the ABPS. The ABPS is the only organization to certify plastic surgeons that is also recognized by the American Board of Medical Specialties (ABMS). Education and Certification: Each doctor will have a different educational background, levels of training, and experience. Look for a plastic surgeon who is board-certified by the American Board of Plastic Surgery to ensure the doctor has undergone extensive training and adheres to the highest safety standards. In addition, many plastic surgeons specialize in certain types of procedures. Your plastic surgeon may have completed a residency or fellowship in an area related to your needs. Before-and-After Photos: Most plastic surgeons will have a gallery of before-and-after photos for prospective patients to review. These photographs should be of actual former patients, and they can give you an idea of what you can expect for your results. Some plastic surgeons may have additional photos you can view in their office as a supplement to what is available online. Patient Testimonials: Reviews and feedback from previous patients can be an invaluable resource for prospective patients. These firsthand accounts can provide insight into the entire process, from consultation to post-operative care. Oftentimes, patient testimonials can be found on the plastic surgeon’s website. By researching your prospective plastic surgeon prior to your initial consultation, you can be better prepared to ask any questions you might have during your first meeting. One of the most important factors in choosing a plastic surgeon is feeling safe and confident in his or her abilities. If you feel any hesitation whatsoever, Dr. Zemmel recommends you keep searching for a plastic surgeon who you feel completely comfortable with.